Wash, core, and cut tomatoes into halves. Spread tomatoes, garlic, and onions onto a baking tray. Drizzle with 1/2 cup of olive oil and season with salt and pepper. Roast for 20-30 minutes or until caramelized. Remove tomatoes, onion, and garlic from the oven and transfer to a large stockpot. Add 3/4 of the chicken stock, bay leaves and butter. Bring to a boil, then reduce heat and simmer 15-20 minutes or until liquid has reduced by a third. 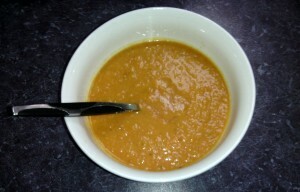 Puree the soup until smooth in a food processor or with an immersion blender. Return soup to low heat. Add cream, and adjust consistency with remaining chicken stock.